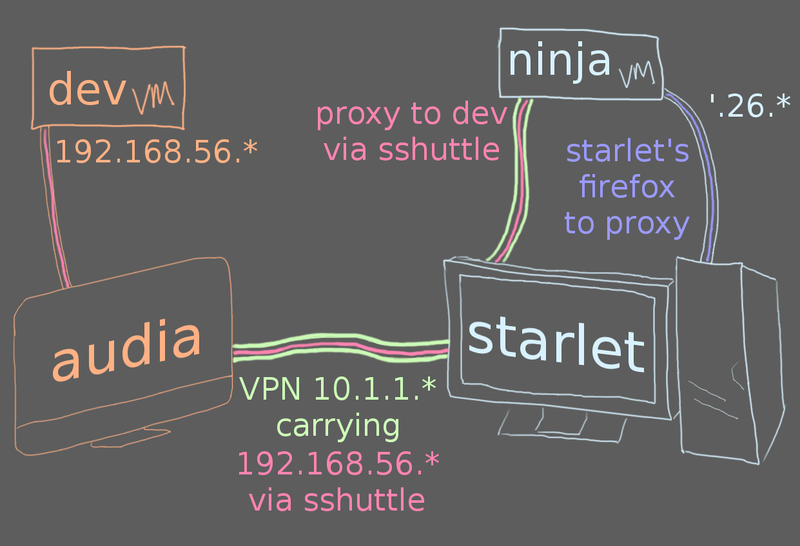 Some of the neat toys that make this work are POSIX-only and starlet is Win64, so the first thing is the introduction of `ninja`: a Linux VirtualBox guest. This guest connects to the VPN, and as before, can now connect directly to audia. As a convenient bonus, with the VPN connected from the guest VM, Windows doesn't see a need to disconnect it when switching users. Now anything running on ninja, such as devproxy, can connect directly to dev without any further trouble. (Of course, dev is listed by its 192.168 IP in ninja's /etc/hosts.) 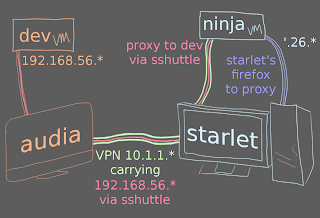 Since I gave ninja a host-only network as well, FoxyProxy can be configured to connect to it, and complete the circuit. Also since ninja is POSIX, I can use mosh to log into audia to cut down on the latency issues due to routing three states over and back (work and home have different ISPs, and the home ISP routes everything three states over.) mosh can't log in directly to dev, because sshuttle doesn't use the normal routing table and the UDP packets intended for ninja don't go anywhere. But using mosh over the slow network and then ssh to the local-from-there guest VM isn't bad. Sometimes I worry that I'm building overly-complex things. Then I remember what has come before and it doesn't look so bad.